Martin "Joe Joe" Prince Jr lives in Bethel,AK and in 2006 he started to send me some photos for use on my website. Martin dropped by at Lake Hood (on 14Aug07), the best place to view floatplanes take off and land, not just the best place in Alaska but in the WORLD!! N2740X is DHC-2 c/n 579. N68083 is DHC-2 Beaver c/n1254. A nice demo of unsticking the floats one by one. N4444Z is DHC-2 c/n 1307. DHC-2 N9878R c/n 1135, also featured on a webpage of mine, dedicated to my 2006 visit. Crashed & burned 18Jul2018, pilot killed. 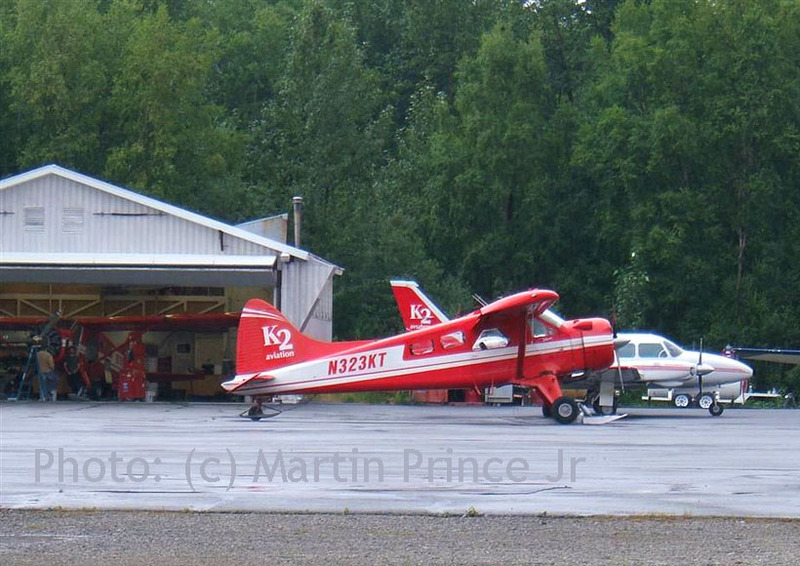 Martin dropped in at Talkeetna on 14Aug07: just like I remember it myself...rainy! C/n 1022 was delivered on 15Jan57 (as 56-0353) to the US ARMY,designated an L-20. It went to Davis-Monthan for storage for a period of 30Jul72 to 28Feb77 and was registered in Jan77 N99128 for Summit Aviation. 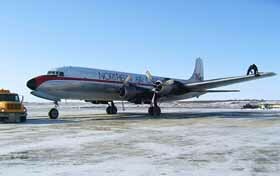 It entered the Canadian register as C-FBDQ on 29Feb88 and 16Jul90 for Air-Sask Aviation of Pinehouse, SK. Next owners were William R. & Lorraine Marie Perrey of Courtenay, BC (registered 18Nov91). In April 1992 it was reregistered N10RM RMH Aeroservices Inc. (Orem,UT) and as N323KT to Rust Properties LLC. (of Anchorage,AK) on 19Aug99. K2 Aviation is owned by Rust Properties LLC (see also below, in the description of Otter N727KT). K2 Aviation, based in Talkeetna, offer flightseeing trips to Mt.Denali and other magnificent peaks of the Alaska Range; check their website. Sadly, N323KT crashed 04Aug2018. The aircaft impacted a snow covered mountain; some on board are believed to have survived the crash with injuries, but perished awaiting rescue. Weather prevented rescue efforts. "Otter 419 was delivered to the Union of Burma Air Force on 28Nov61 with serial UB659. The Air Force took delivery of nine Otters, all were packed into crates and shipped to Burma, where they were re-assembled and entered service. Its Air Force aircraft were re-serialled, adopting Burmese numerals, equivalent of the old serial with a '4' prefix and deleting the UB. Thus UB659 became 4659, depicted on the side of the aircraft in Burmese numerals. The Burmese Otters were withdrawn from service in 1985 and stored. In 1989 six of the Burmese Otters were purchased by Mr Trevor Ross of Vancouver. 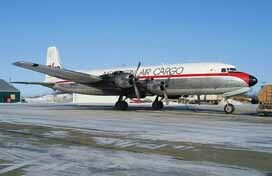 They were shipped to Vancouver, where they were stored in the Aeroflite Industries hangar at the International Airport and offered for sale. They had all arrived in Vancouver by early December 1989. The buyer of Otter 419 was Pro Mech Air Inc of Ketchikan, Alaska. 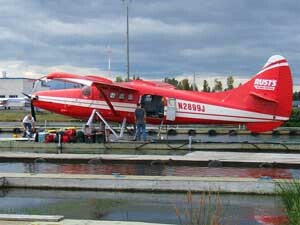 The Otter was first registered N472PM in Mar91 to Kenmore Air Harbor Inc of Kenmore, Seattle who prepared the Otter for its delivery, and it was then registered to Pro Mech Air in May 1991 and entered service with them, based at Ketchikan. The Otter flew for Pro Mech Air for more than three years, until sold to Wipaire Inc of Inver Grove, Minnesota. It left Ketchikan on delivery to its new owners on 29th September 1994 and was registered to them that month. Wipaire Inc, one of the world's leading manufacturers of aircraft floats, used the Otter to test and certify its new Wipline 800 floats, both straight and amphibious. The testing was done at their facilities in Minnesota. Once the FAA had issued the STC on the new floats, the Otter was sold. The purchaser was Taquan Air Service Inc of Ketchikan, to whom the Otter was sold in March 1995, on Wipline 8000 amphibious floats. In part payment for the Otter, Taquan traded into Wipline the wreck of their Cessna Caravan on straight Wip 8000 floats, which had crashed the previous January at Craig, Alaska when it hit a submerged log on landing. 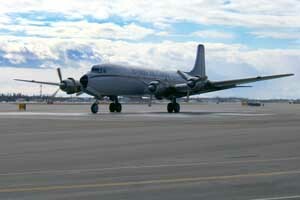 Otter N472PM returned to its previous base at Ketchikan, arriving on 01May95 on its ferry flight from Minnesota. It carried two PT6A-135 turbine engines as cargo, one of which was to be used to convert Otter 382 to a Vazar turbine. N472PM then entered service with Taquan Air on their scheduled services and charter flights. It was arranged for the Otter to be converted as a Vazar turbine. The work was performed by Island Flight Support Ltd at Victoria, BC and N472PM then continued flying as a turbine for Taquan Air until the company ceased operations, as a result of financial difficulties in Dec99. 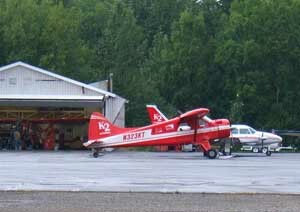 N472PM was one of a number of aircraft put up for sale at auction by the receiver of Taquan Air in May 2000. It was on EDO 71710 floats, which had replaced the Wipline 8000s. It was advertised as having a total time of 10,184 hours on the airframe, with its PT-6A engine having a total time of 7,081 hours and being in need of overhaul. 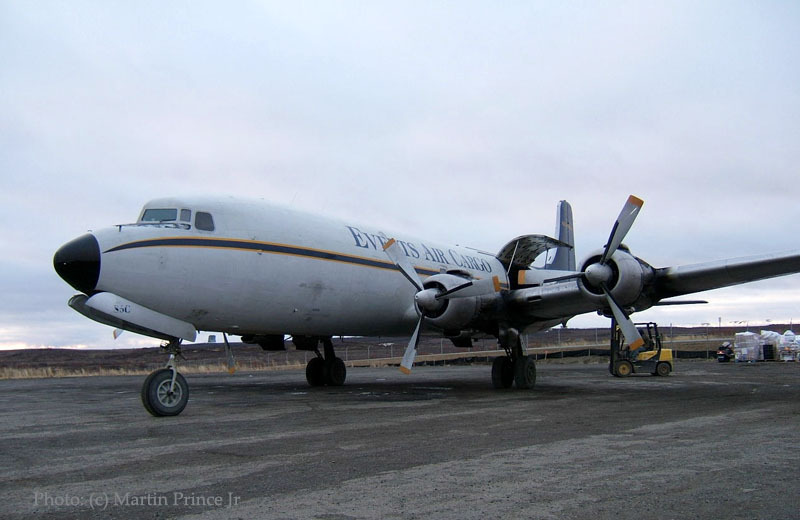 It did not sell at the auction and was reported in August 2000 as "sitting forlornly on the lower ramp at Ketchikan Airport, minus propeller and with a timed-out engine". The receiver arranged for the Otter to be ferried to Anchorage, Alaska where a new engine was installed. It was advertised again for sale in Mar01 with a zero-timed engine, asking price US$840,000 and 'ready to work'. On 9th May 2001 it was registered to American Aeromotive & Aero Energy Technologies Inc of Dover, DE who had supplied the engine, but remained parked at Anchorage and for sale by the receiver of Taquan Air... It was eventually sold to Anchorage-based Rustair Inc, to whom it was registered on 31Jul02, the registration being changed the following day from N472PM to N727KT. 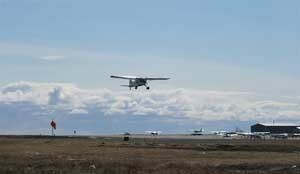 It joined K2 Aviation, which is a division of Rustair Inc but based at the Talkeetna Airport. The Otter joined some Cessna 185s and Beavers and is used to fly tourists and climbers to glaciers in the Alaska Mountain Range, as well as to fly sight-seers around Mount McKinley, flying up to 20,000 feet - the Otter is oxygen-equipped. 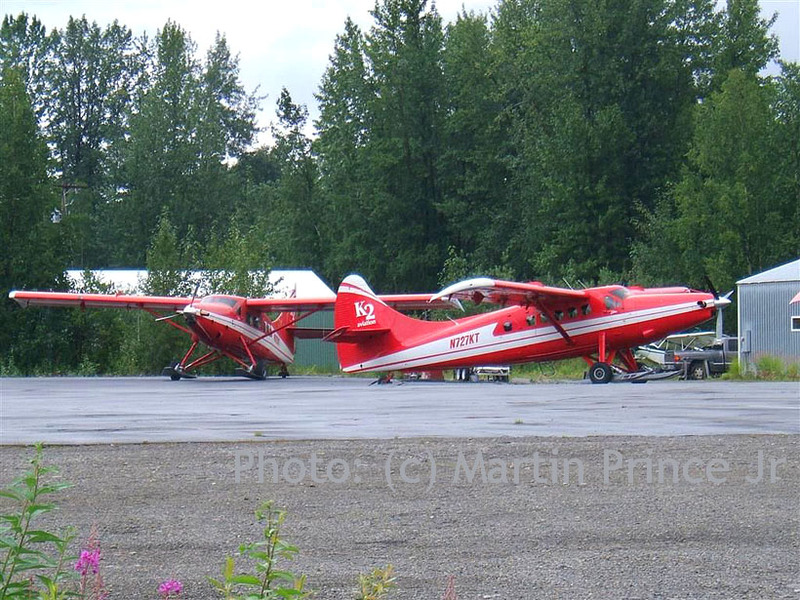 In Mar03, Otter N929KT (461) also joined the K2 Aviation fleet, based at Talkeetna. 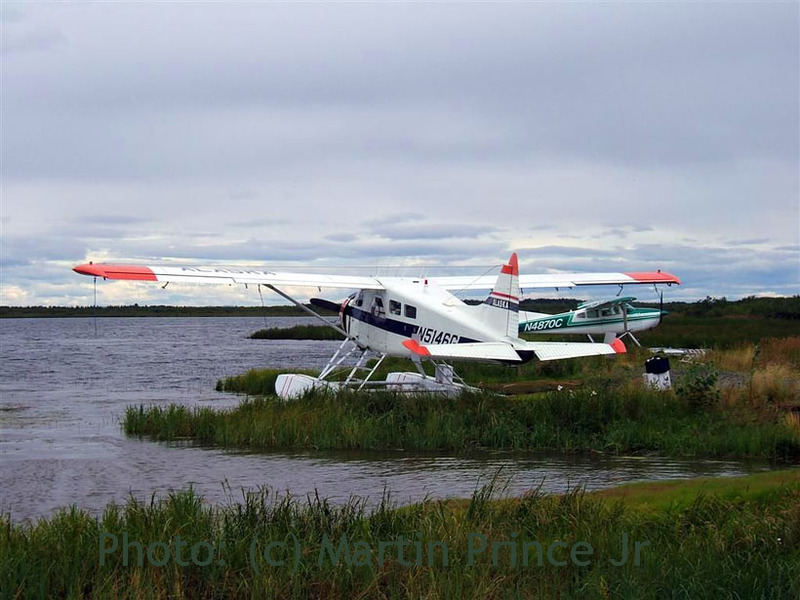 "Here is a shot on a not so nice day (18Aug07) at Hangar Lake Seaplane Base in Bethel of Fish and Wildlife's DHC-2 Beaver N5146G, with other personal float planes in the background." 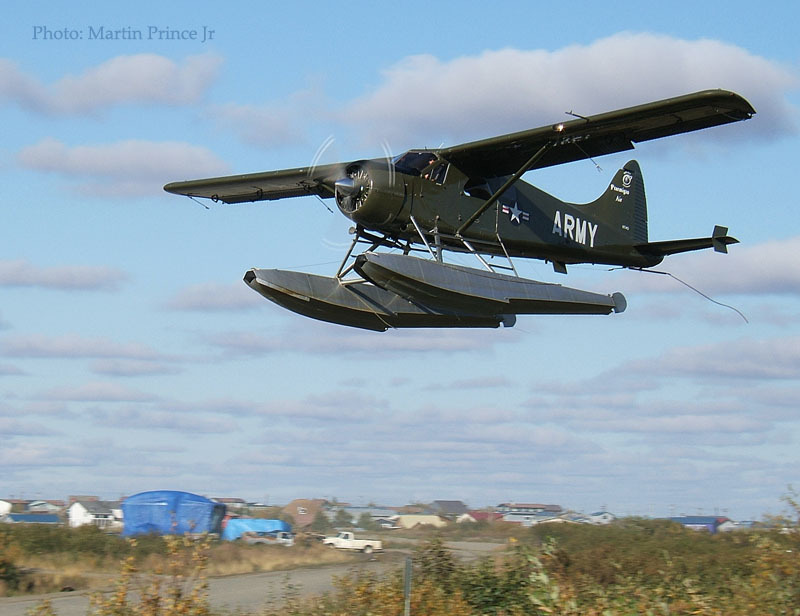 This DeHavilland Beaver has c/n 247 and was delivered as an L-20 Beaver on 01May52, with military serial 51-16487 (USAF). Tailnumber N5146G was assigned way back in May 1971 for the present owner and operator, the Civil Air Patrol Inc. (Hq at Maxwell AFB,Alabama) but is Alaska based. 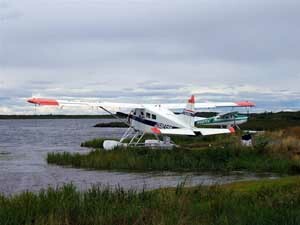 It seems it was involved in an accident during step-taxi demonstration, on 23Jul06, but fortunately no injuries were reported; it did sustain substantial damage though; this happened on 7 Mile Lake, Alaska. By googling I came to a scary amount of lakes in the Bethel Borough... I wonder if they all have floatplanes, e.g. 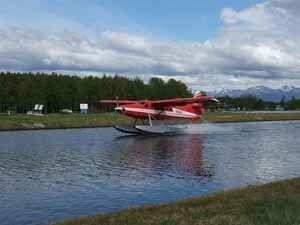 "Norseman Lake" has Noorduyn Norseman floatplanes...?! 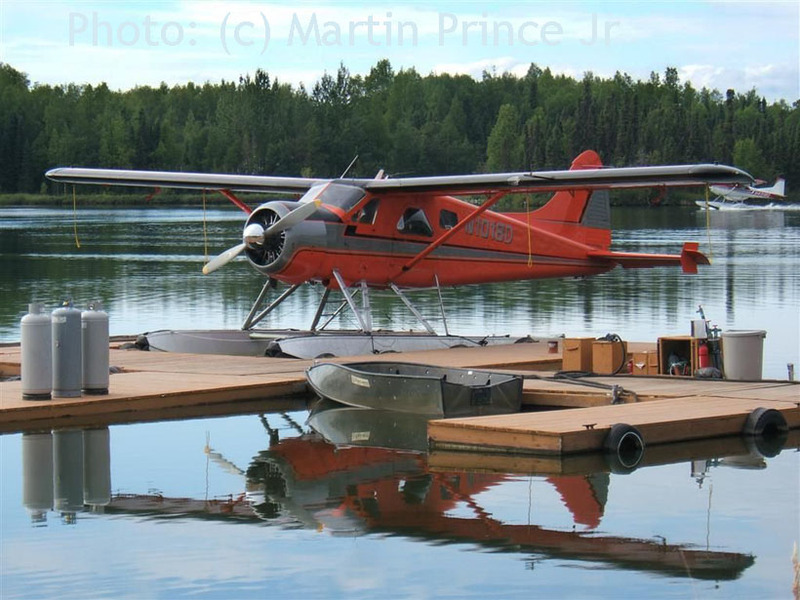 "... on the way back from Fairbanks yesterday (12Aug07), I stopped at Willow Lake and took a picture of Willow Air's N1018D Beaver on a beautiful afternoon." 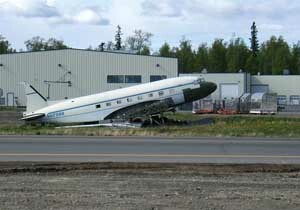 N1018D has c/n 293 and was registered to (BAL Inc, dba) Willow Air of Wasilla,AK on 11Aug2006. It was manufactured in 1952 and DHC-2.com has more! 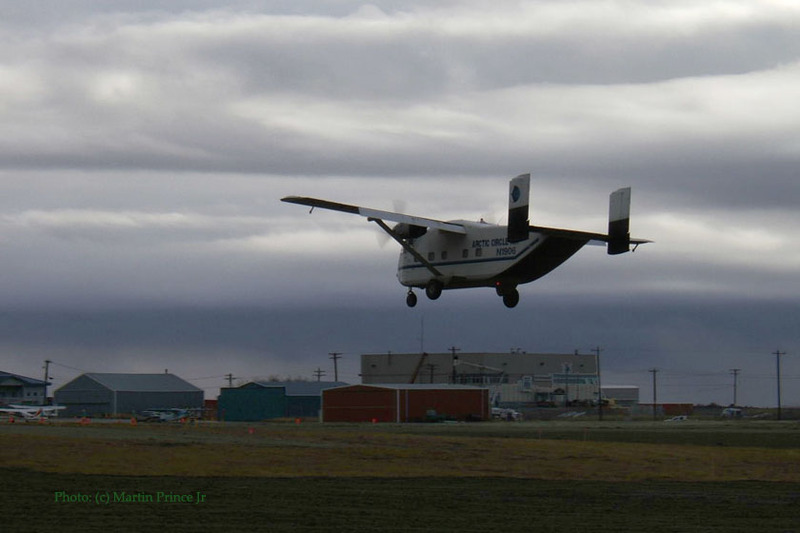 "Here is a leased DHC-2 Beaver, N96DG, which Ptarmigan Air is using for the remainder of the season. 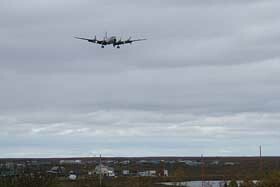 It is on final approach to H-Marker Lake, here in Bethel." 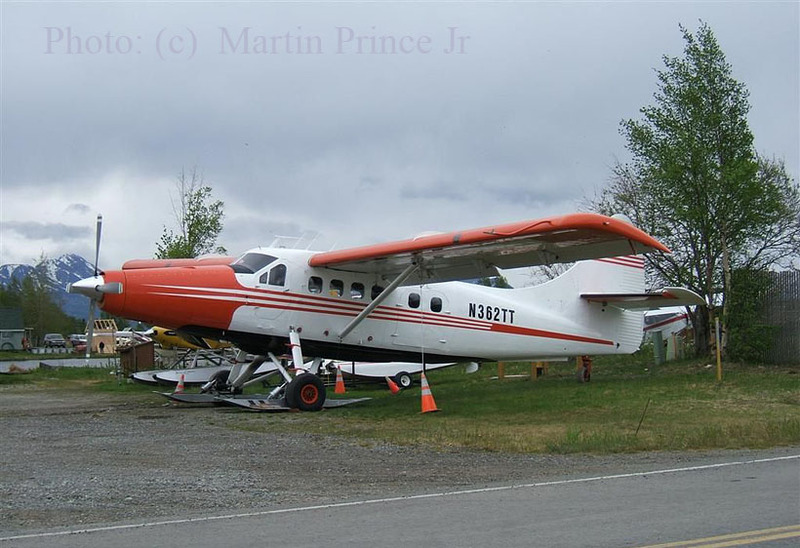 I came across N96DG in Ketchikan in 2006, its history is detailed in my page Ketchikan 2006.
" 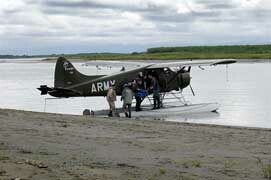 DHC-2 N734Q is seen loading on the Kuskokwim River in front of Bethel. They are heading out to Kisaralik Lake with rafters. Overcast skies with calm winds and a temp of 54F/12C..."
Martin sent me a photo earlier, to which I added some details, look down. 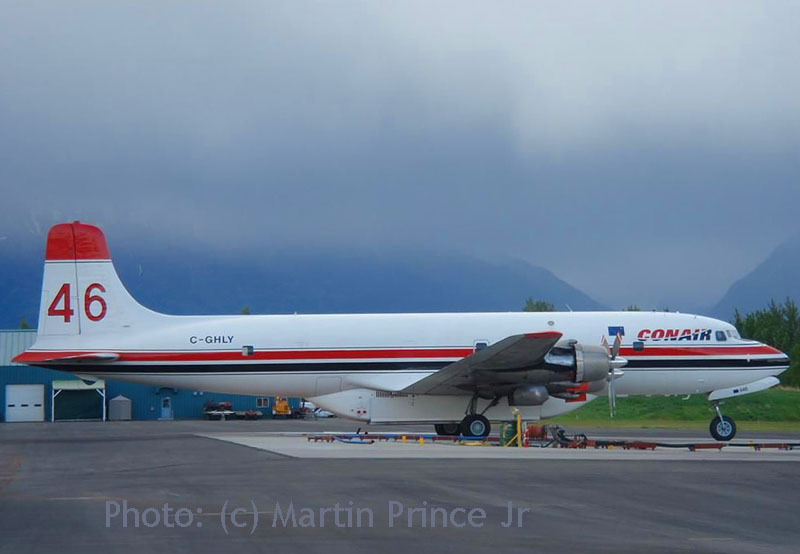 Martin photographed Conair's Tanker 46 C-GHLY at Palmer,AK on 08Jun07 while some impressive weather was on its way.. Source: Piston Engine Airliner Production List / TAHS 2002. Martin noticed the C-119F N9027K seems to have been moved again, if you compare it to my photos taken a year before, June 2006. It was moved to the South Ramp to make room for ramp expansion in 2018. 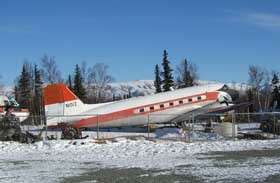 Roger Brooks turned it over to the Alaska Aviation Museum where it may, one day, be on static display here in Anchorage. 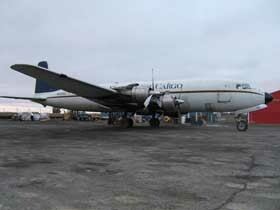 And N67588, a C-47A c/n 20536, has been a flightless bird too for many years now, only moving on the ground when airport works requires to relocate them. For more details see my June 2006 photos at Anchorage. 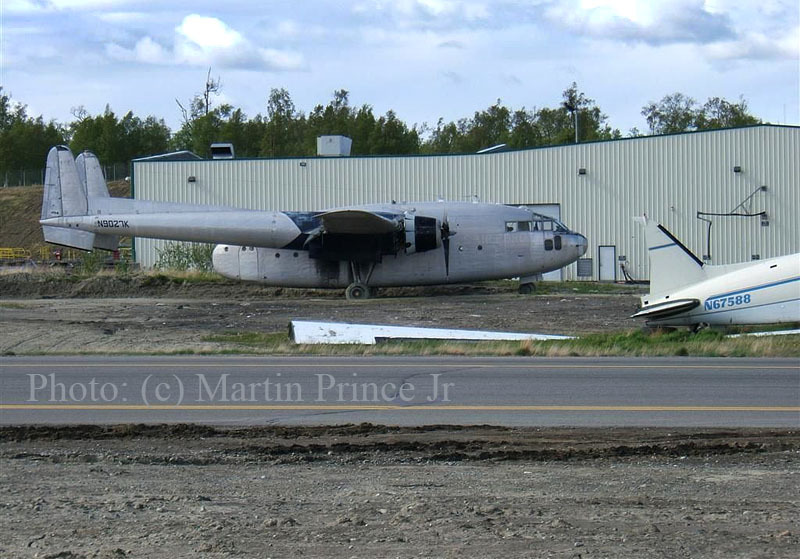 Upon my ALASKA JUNE 2012 visit I noticed the C-119 still present in that very same spot, but N67588 had disappeared. It has been reported as 'destroyed'. A few photos of N777YA, in winter conditions, can be seen HERE. 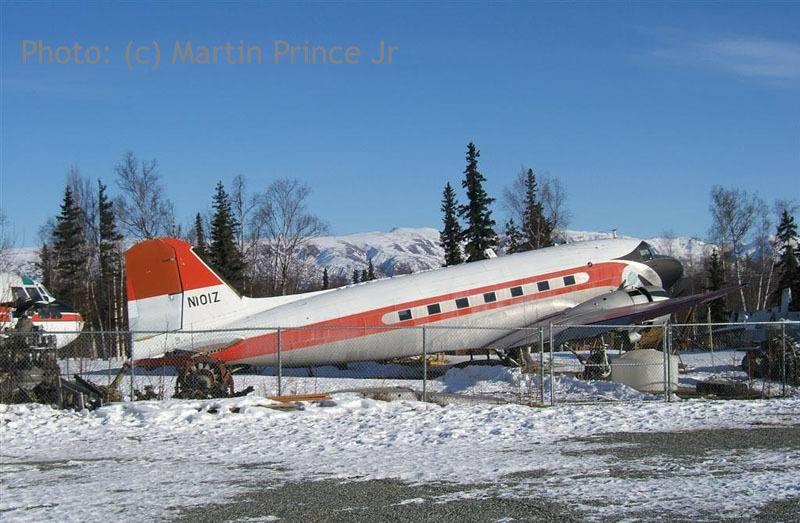 N777YA was seriously damaged, perhaps beyond repair, on a landing incident at Nixon Fork Mine,AK 22Nov2015. "Howdy Rudi from Anchorage. Here are a few shots from Lake Hood and the ramp at Ted Stevens Airport, on May 24th 2007". 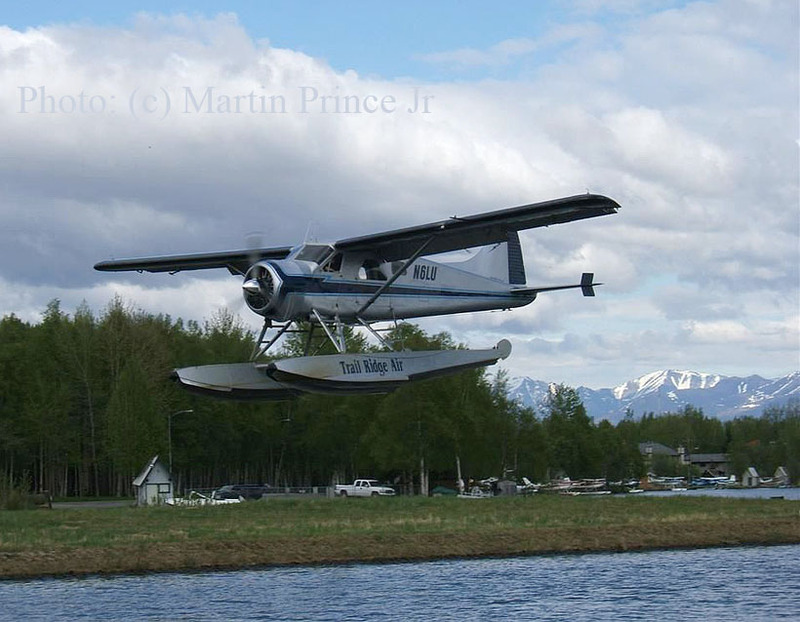 Fine floatplane action, fine scenery... We see here de Havilland DHC-3 Otter N2899J (c/n 425). 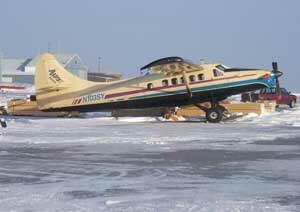 It was built in 1961, registered to Rustair Inc of Anchorage 26Mar90 and modified to Turbo Otter during its career. "Otter c/n 425 was delivered to the Ghana Air Force on 28Dec61 with serial G307 and continued its service until 1973 when withdrawn and put up for sale. It was registered to Joseph V.Masin of Rodenkirchen, West Germany as N17684 but soon sold to Air Craftsmen Ltd of St.John, New Brunswick, a company which specialised in buying, refurbishing and selling on ex-military Otters. 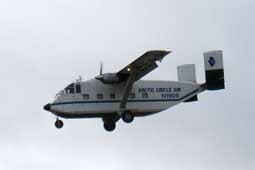 On 26April74, Air Craftsmen Ltd reserved Canadian marks C-GLCR for Otter 425. It was put into a crate and shipped to St.John, where it was rebuilt and civilianised. 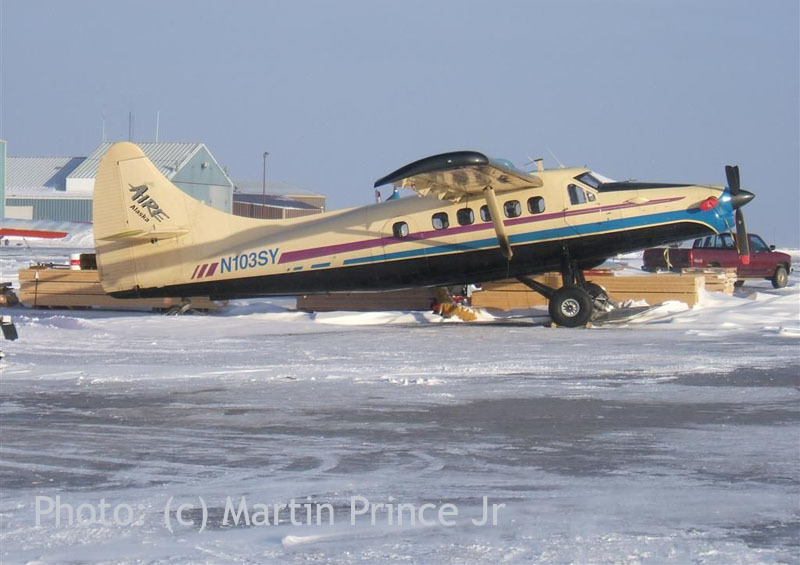 The DHC-3 Otter was sold to a leasing company, Les Fonds Nordic Ltee, for lease to Air Gava Ltee, and on 19Aug76 it was delivered from St.John to its new base at Schefferville, QUE and entered service with Air Gava Ltee. 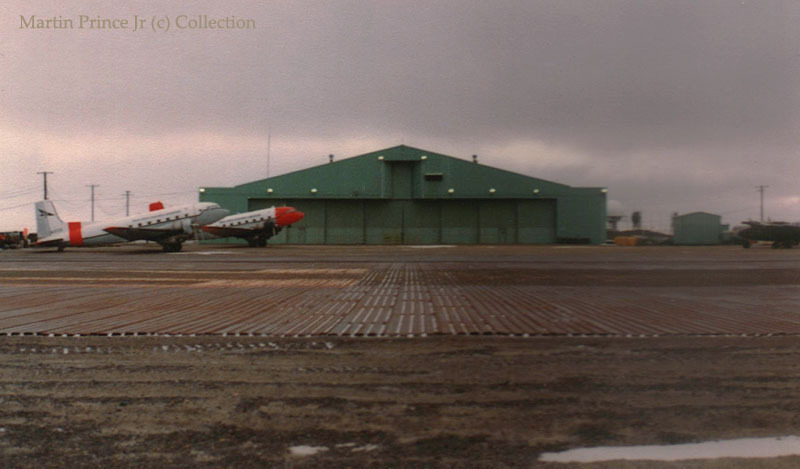 C-GLCR was involved in an incident on 12Nov79, landing at Lake McCabe after a flight from Schefferville. After landing on the frozen lake (temperature at the time was -12C) the pilot taxied the ski-equipped Otter towards the shore. 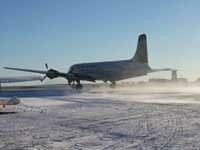 As the speed of the aircraft decreased, it broke through the ice and settled in four feet of water, damaging a wing... Although it was reported that there was ten inches of blue ice on the lake, the quality and thickness of the ice closer to the shore was much less, and it was subject to water currents. The pilot was unaware of the difference in the ice conditions. 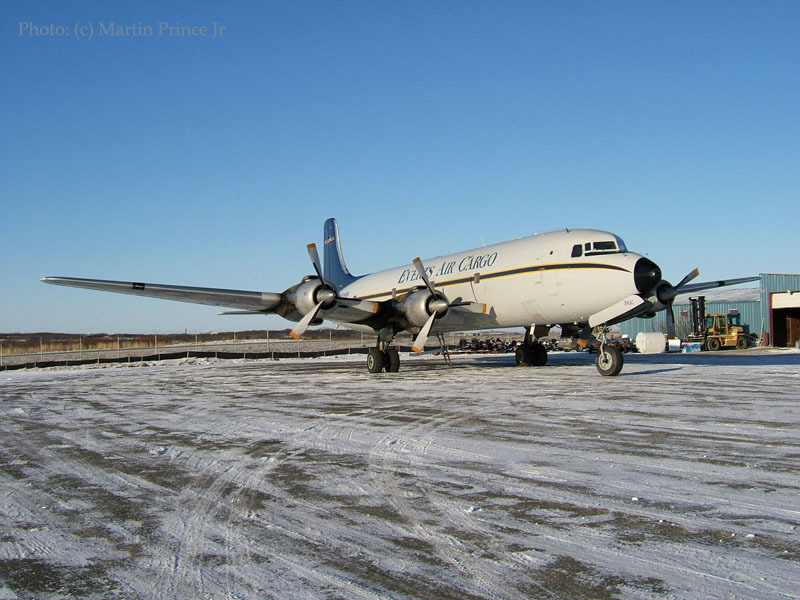 Fortunately, C-GLCR was repaired and returned to service with Air Gava Ltee, and continued flying for the company in northern Quebec until 1981, when Air Gava encountered financial difficulties and ceased trading. C&S Enterprises Ltd, aircraft brokers, of Ontario were appointed to sell Air Gava's fleet of aircraft, including its three Otters, C-FQMN (184), C-GLFL (329) and C-GLCR (425). C-GLCR had at that stage of its career a total time of 2,971 hours, was on floats, and with a new Certificate of Airworthiness had an asking price of $155,000 Canadian. The Otter was sold to 40 Mile Air of Tok,AK on 12Feb82, registered N2899J. It flew for 40 Mile Air in its Air Gava colour scheme, orange overall with a white cheatline. but again it met with an accident, on 28Oct84 while landing on the gravel airstrip at Dan Creek near McCarthy,AK on a flight from Chitina. The aircraft hit a downdraft, landed hard and struck the wing on the runway surface. The undercarriage was pushed into the fuselage. Temporary repairs were effected on site and the Otter was then flown to Seattle for permanent repairs, after which it resumed service with 40 Mile Air. In Dec86 N2899J was sold to Bering Air Inc of Nome, Alaska and flew for this company until sold to Rusts Flying Service Inc, based at Anchorage Lake Hood, in Jun89. It was repainted into Rusts colour scheme, and throughout the 1990s flew for the company, becoming one of the most well-known Otters in Alaska. It was operated as a piston Otter, mostly flying tourists, hunters, fishermen etc during the summer months. 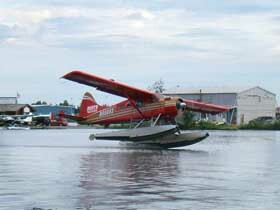 After more than a decade of service as a piston Otter with Rusts, the company arranged for it to be converted to a Vazar turbine in June 2000, the work being performed by Island Flight Support Inc at Victoria, BC. It then re-entered service with Rusts as a turbine Otter." N361TT is a de Havilland Beaver , c/n 361 and registered on 05Jul2000 to Kakeldey Leasing Corporation, Anchorage,AK. FAA's website N-inquiry also offers the year of manufacture: 1959. "In April 2000, C-GVDM was advertised for sale through C&S Aircraft sales, with a total time at that stage of 11,806 hours on the airframe. It was sold to Kakeldey Leasing Corporation of Anchorage, AK to whom it was registered N361TT in July 2000. This is a leasing company which leases out its aircraft to other airlines and outfitting companies. 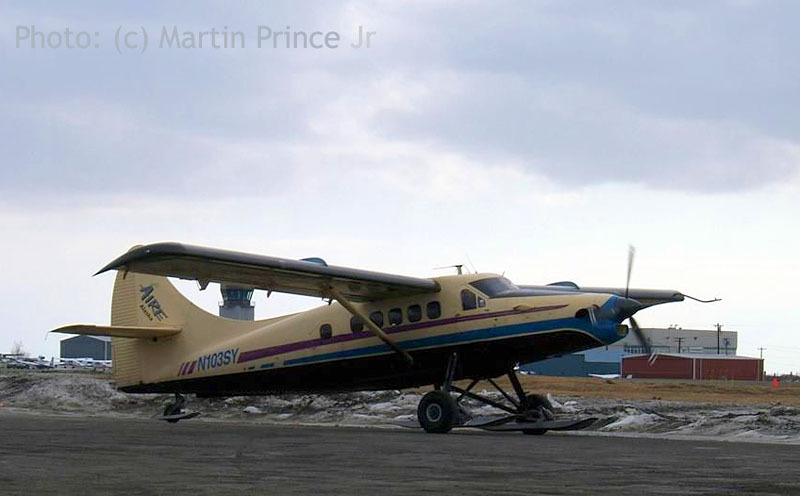 In May 2001, the Otter went on lease to Renew Air Taxi of Dillingham, Alaska. This company flew the Otter and a Cessna 185. 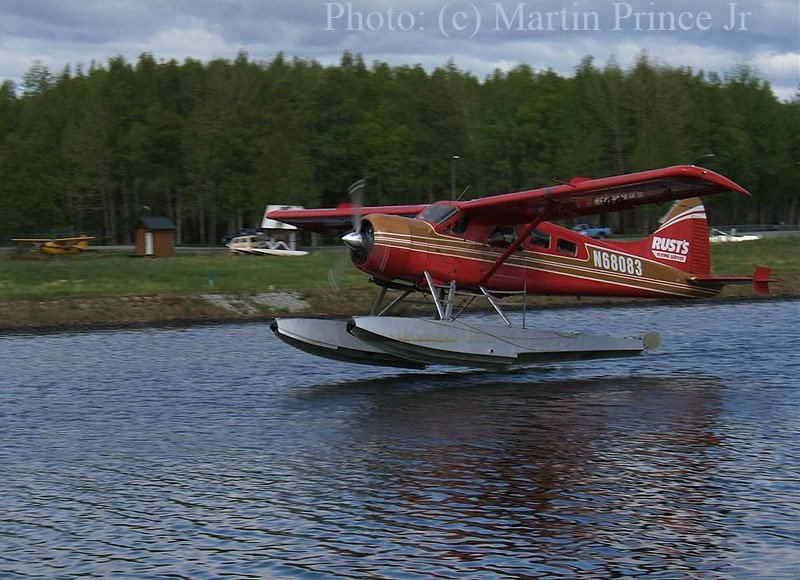 According to its website: During May to October time, we are operating out of Aleknagik Lake, Dillingham. Aleknagik Lake is part of the Wood Tikchik State Park, one and a half million acres of pristine wilderness accessed only by air for fishing, rafting, hunting and ecotours. 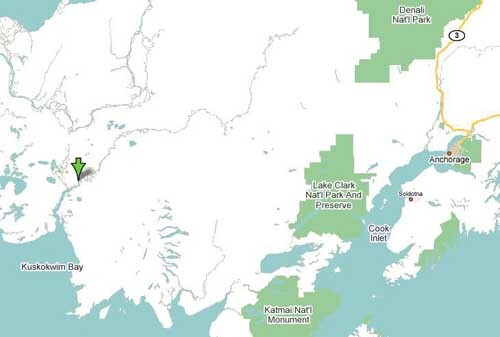 We also access the Togiak Nation Refuge and Katmai National Park. 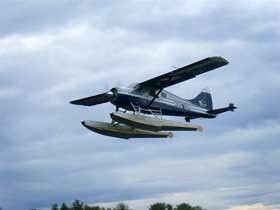 In March 2003 the Otter arrived at Vernon, BC for conversion to a turbine Otter by Kal Air. It emerged from the hangar in early June 2003 as a Texas Turbine conversion with the Garrett TPE-331 engine, and departed back to its base at Dillingham, Alaska to continue flying for Renew Air Taxi. The photo was taken 26May07. See also Martin's next page for a Nov.2008 image, in flight. 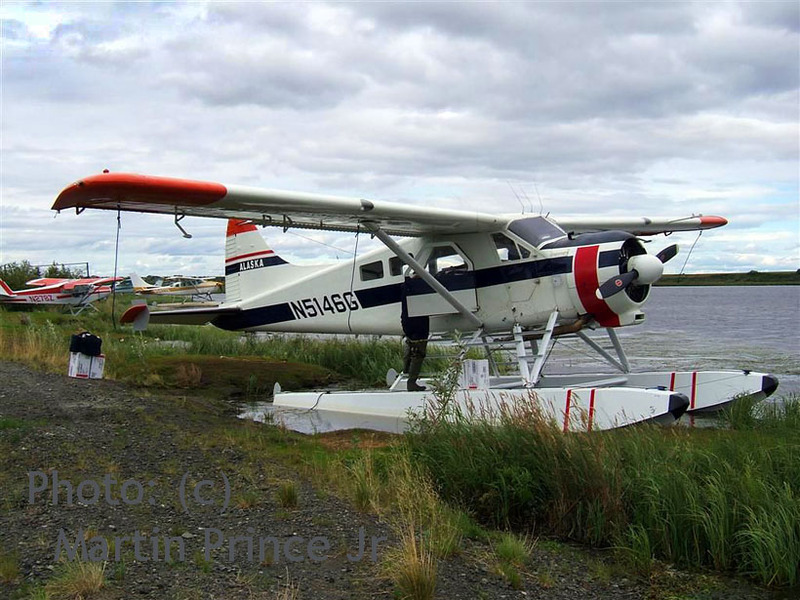 Unfortunately N361TT suffered a fatal crash on 23Sep11, from Aviation Safety Network (ASN) the following: "DHC-3 Otter (Garrett TPE-331 powered Texas Turbine conversion) N361TT crashed near Heitman Lake, near Mile 14 of the Chiniak Highway, Kalsin Bay, AK, six miles south of Kodiak, AK, when approaching Kodiak Aiport (PADQ). N362TT is a DHC-3T c/n 362, registered to R&J Aircraft Leasing Corp of Anchorage,AK on 05Jul2000, seen here on 26May07. "... 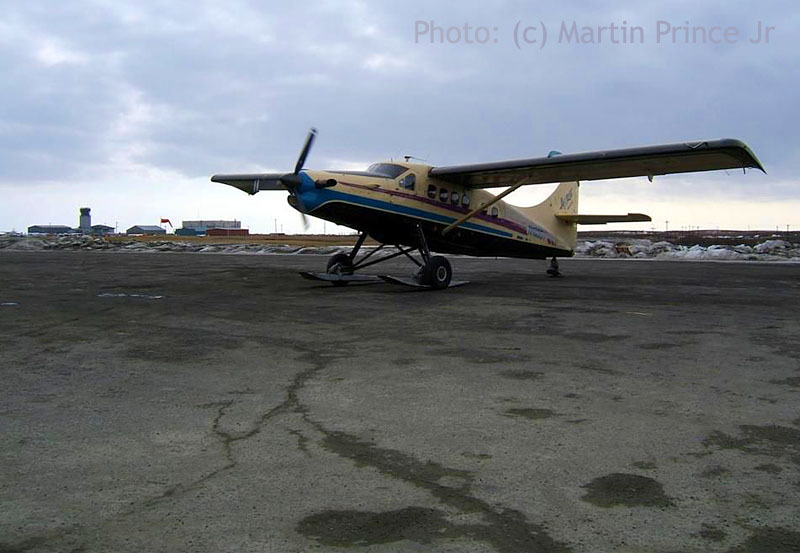 The leasing company then leased the Otter C-GLQX to Johnny May's Air Charter Ltd of Kuujjuaq, QUE to whom it was registered in July 1999. 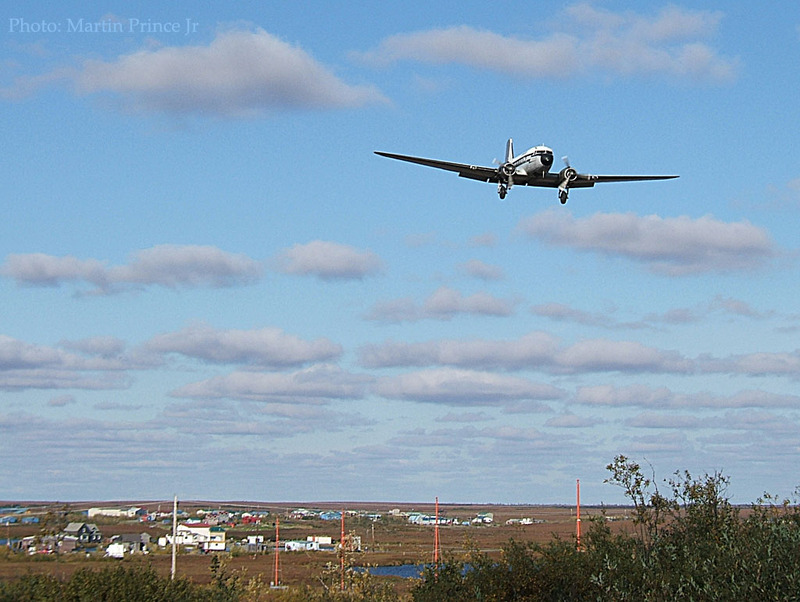 On 08Sep99 it was involved in an accident on a flight from its base at Kuujjuaq to a caribou hunting camp at Lac Bobby, 160 miles to the west. On arrival at the lake, conditions were sky obscured with visibility reduced in fine rain. Having 'splashed down', the pilot realised that he had alighted too near the shoreline. He cut the power but it was too late to prevent the Otter running aground. No one was injured but substantial damage was caused to the propeller, right wing and right float, which had collapsed. The right wing hit the water and was bent and crumpled. The repair of the Otter was entrusted by the insurers to Air Wilga of Laval, Quebec. They chartered an Air Saguenay Otter and flew up a replacement wing, which was strapped to the float supports on one side of the Otter, a canoe strapped to the other side. Repairs were carried out at the side of the lake. The float was repairable. The new wing was fitted using a support of fuel drums and wood. 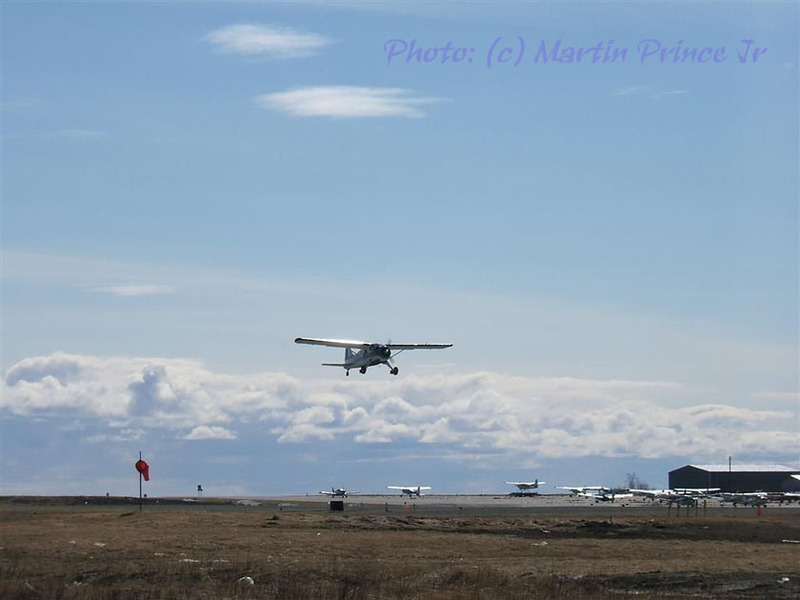 C-GLQX flew back to Laval for final repairs, escorted by Otter C-FEYY (19) of Air Wilga. In April 2000, C-GLQX was advertised for sale through C&S Aircraft Sales, with a total time at that stage of 14,951 hours on the airframe. They were also selling sister ship C-GVDM (361). 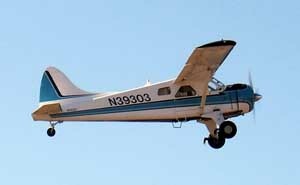 Both Otters were sold to a leasing company in Anchorage, Alaska, number 361 being registered to Kakeldey Leasing Corporation as N361TT and 362 being registered to an associated company R&J Aircraft Leasing Corporation as N362TT. These companies, owned by Ron Kakeldey, lease out aircraft to airlines and outfitting companies. 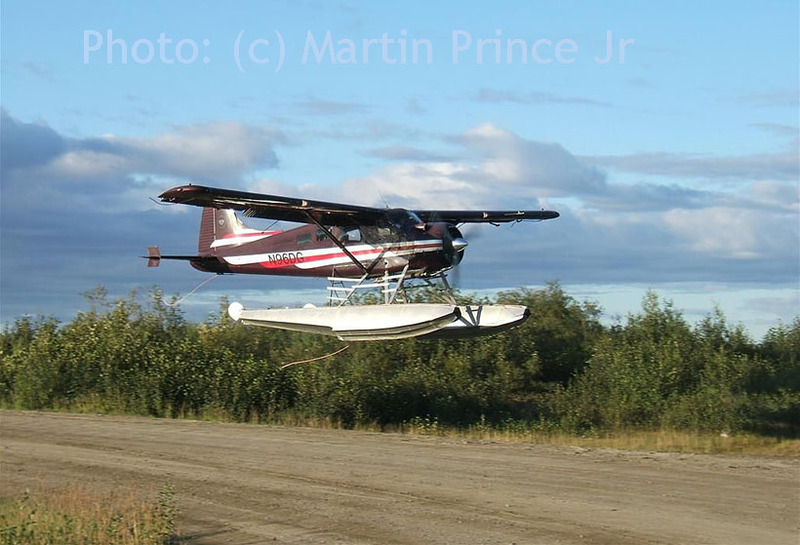 During the summer of 2002 the Otter was leased to Ultima Thule Outfitters of Chitina, Alaska pending the delivery of their own turbine Otter N226UT (226). 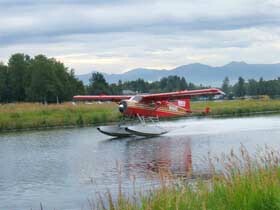 In January 2003 N362TT went on lease to Grasshopper Aviation of Wasilla, Alaska to replace their Otter N3904 (54) which had crashed. 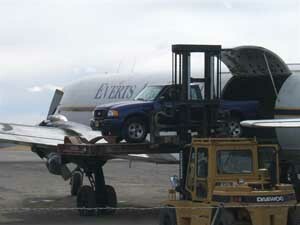 In September 2004 the Otter was noted parked at the Anchorage International Airport, undergoing maintenance." 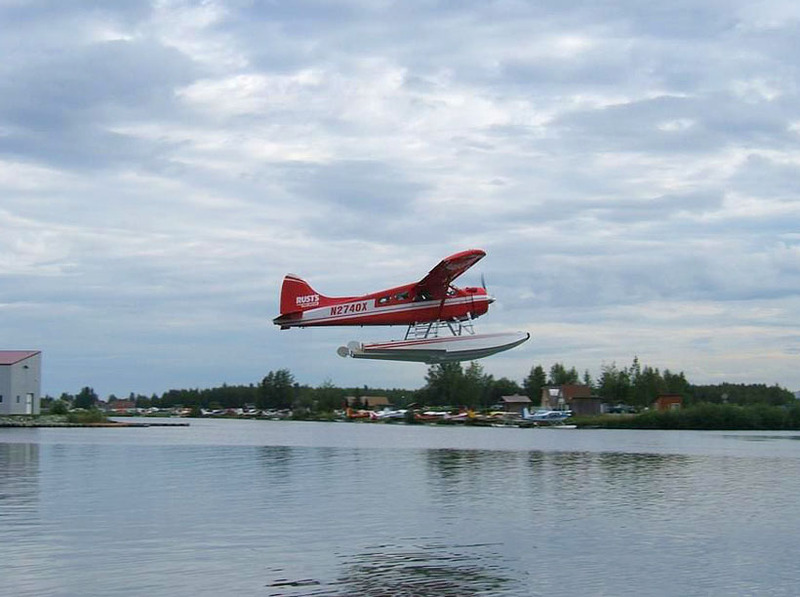 N6LU, a de Havilland DHC-2 Beaver, is seen here in fine Alaskan scenery, landing at Lake Hood. N68083 is a DHC-2 c/n 1254. I too spent some time at Lake Hood, in June 2006. Martin continued along this large lake, which is in fact 2 lakes: Lake Hood and Spenard Lake. We see here N698TK c/n 262, which has been registered to the Tikchik Lodge Narrows Inc since 25Nov92. 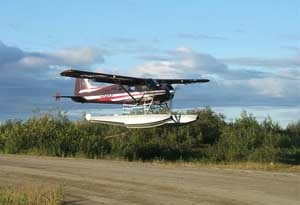 DHC-2.com has more on this fabulous floatplane. A nice archive to browse are the Alaska's Digital Archives. De Havilland DHC-2 Beaver N39303 (c/n 1221) was delivered on 16Jul58 as 57-6525 to the US ARMY (designated L-20 Beaver). It moved to Europe as 3B-GF for the Austrian Air Force (Österreichische Heeresfliegerkräfte). At some point it was stored at Langenlebarn-Fliegerhorst Brumowski. For an unknown owner it became registered G-BILO and reregistered as N39303 in June 1983 for Kenmore Air Harbor Inc. of Kenmore, WA. 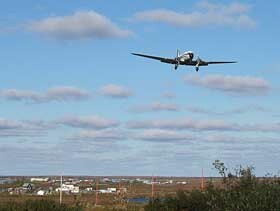 Source: DHC-2.com and FAA N-inquiry. Martin wrote: "Everts was here on this nice warm April day (22Apr04), pleasant 52F degrees, offloading a Ford Ranger pickup truck and some bypass mail. 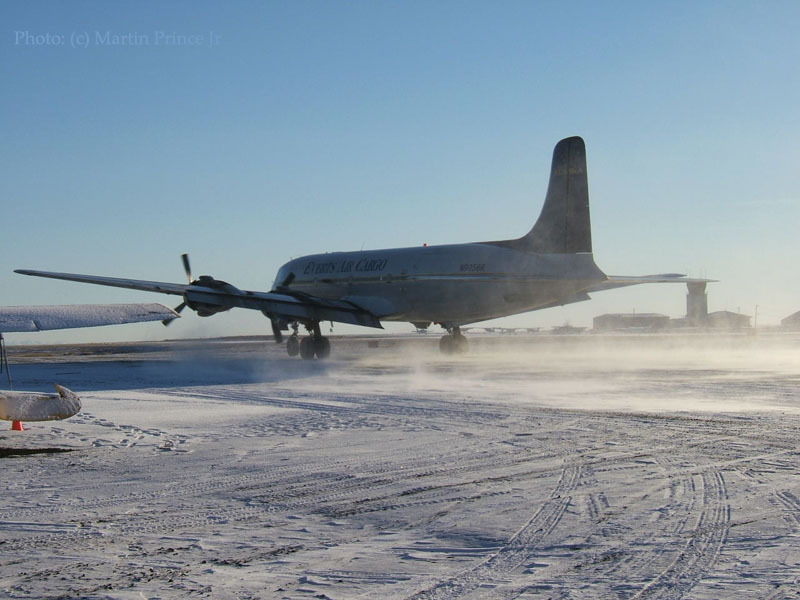 This photo of Douglas DC-6BF N6586C was taken at 2:30pm Alaska Daylight Time." "I made another trip to Fairbanks on Friday the 13th, for the fun of it. 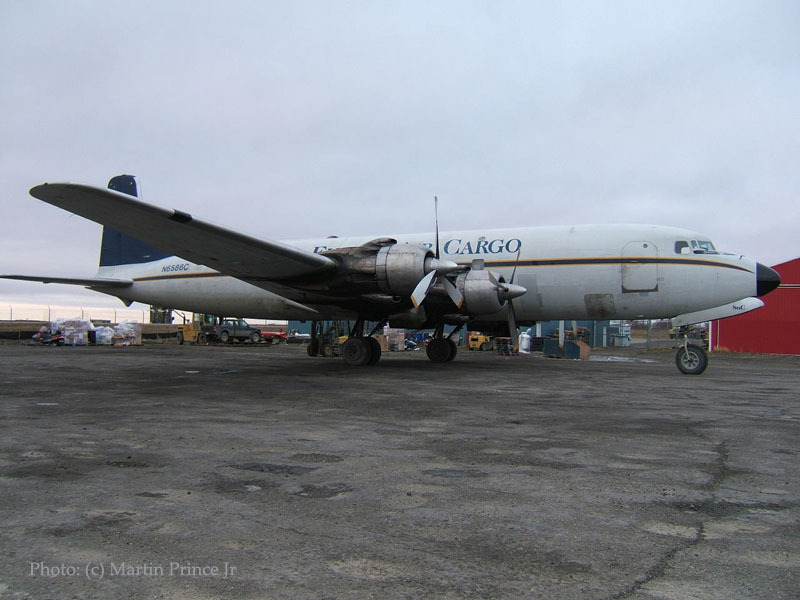 Brooks is working on the Carvair and I got a shot of Everts N400UA doing a run-up, on the ramp in FAI. The temperature today was a high of 47F above..., very nice day today!" 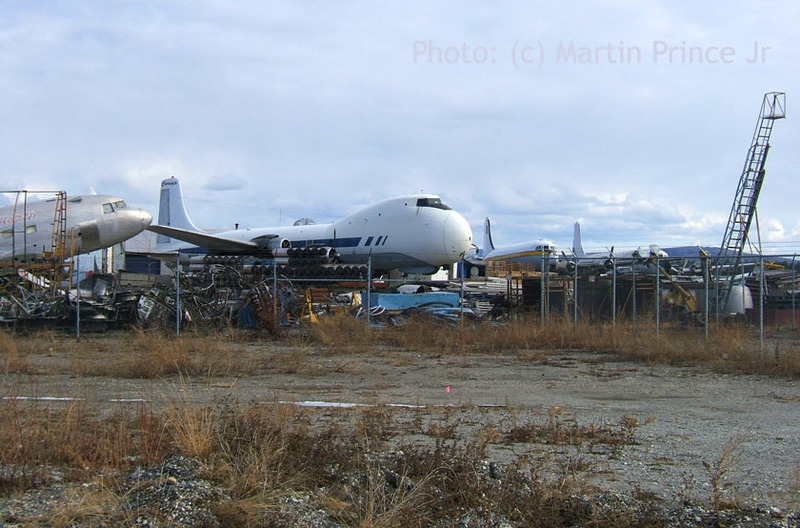 The photo shows Roger Brooks' yard with both operational- as well as stored aircraft. 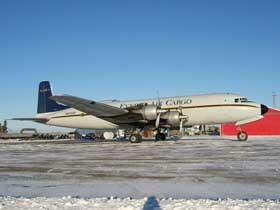 The ATL.98 Carvair is N898AT. N400UA is a Douglas DC-6A (c/n 44258), operated by Everts Air Fuel, hauling fuel to the remote communities of Alaska, though registered to C&R Leasing LLC (C&R no doubt being the initials of Chris and Robert Everts) since 02Aug04. Previous operators include Woods Air Fuel, Gillispie Air Transport, Piedmont Air Transport and Pan Am. 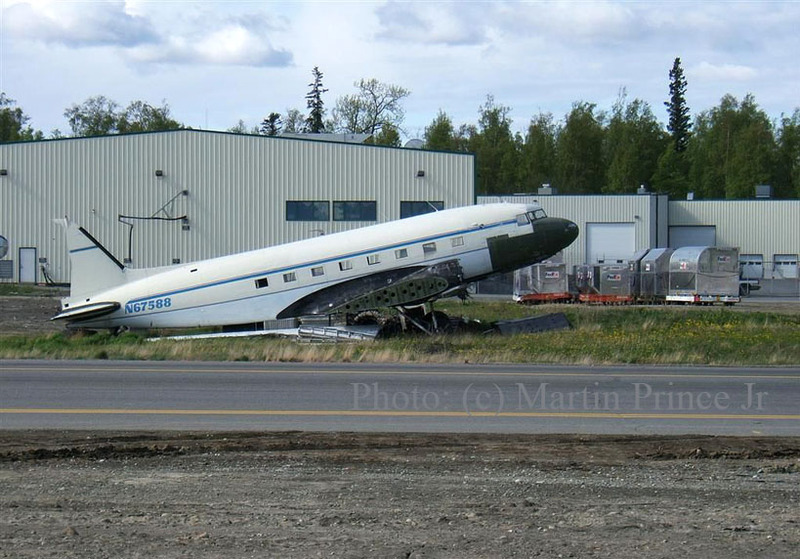 Upon a 2012 visit to Fairbanks I noticed it stored, in the 'donoryard'. The World of Snow ! "Much to my suprise there is a Turbine Otter here in Bethel, don't know what exactly its doing here. We don't get these around here too often." 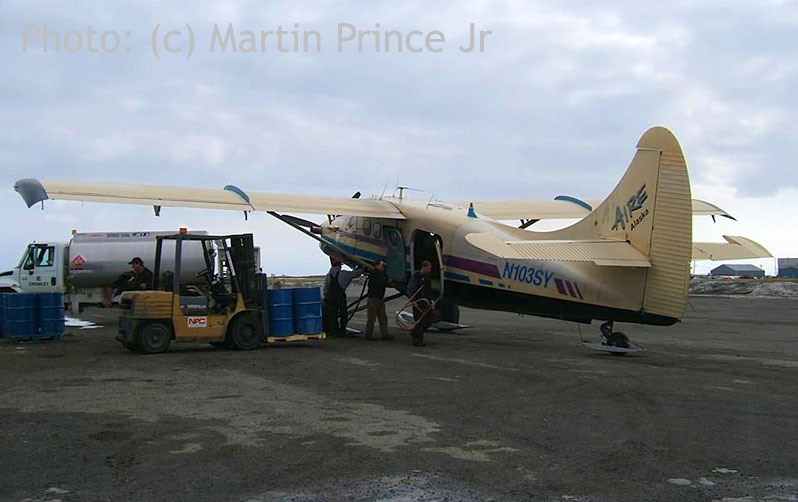 When I checked FAA's N-inquiry database in April 2007, I found N103SY, c/n 296 de Havilland Otter "Status:in question". Also it still had its engine described as 'Reciprocating' while it clearly shows a modern turbine here! Otter 296 was delivered to the United States Army on 1st November 1958 with serial 58-1688 (tail number 81688). It was transferred to the 18th Aviation Company for deployment to Vietnam in January 1962 and continued to fly for the Company until March 1966, when it was returned to the ARADMAC Depot, Corpus Christi, Texas for overhaul. On completion of the work, 81688 was airlifted back to Vietnam in May 1966 and joined the 54th Aviation Company. The Otter is mentioned a few times in the 54th Aviation Company history. During June 1968 the Otter was hit by enemy fire at Cao Laun. During September '68 "the Photo Mission had a frustrating week with aircraft 688 pumping oil out of the collector box and, by way of the slipstream, all over the camera lens". In Jan70, the Otter made an emergency landing at Vinh Long after engine failure. 81688 was one of five Otters in Vietnam selected by the Army for transfer to the Nicaraguan Air Force under a Military Aid Program. The five were shipped from Vung Tau, arriving at the port of Balboa in Panama. With the FAN, 81688 received the serial FAN-1014. The Otter continued to fly for the FAN throughout the 1970s, and was the only one of the five Otters to continue flying after the fall of the Somoza dynasty in Nicaragua in July 1979. The following year, the air arm became the Fuerza Aerea Sandinista, and was increasingly supplied with Soviet equipment. In 1987 there was a clear out of what was left of the original western-supplied equipment. Four T-28s, an IAI Arava, several Hughes helicopters and the Otter were sold. 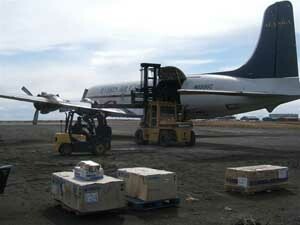 They were all loaded onto trucks at Managua and driven to Costa Rica. The Otter and the T-28s had been purchased by Venture Aviation, who had them shipped to Victoria Air Maintenance at Sidney Airport, Victoria, BC on Vancouver Island. Here the Otter was sold to aircraft brokers C&S Enterprises of Hawkesbury, Ontario to whom it was registered C-FANJ on 4Nov87. 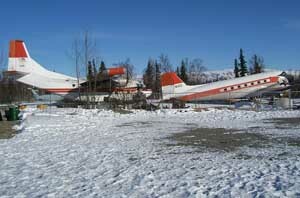 It was almost immediately sold on, being registered N5056Q to its new owners, 40 Mile Air, of Tok, Alaska on 02Dec87. It was restored to airworthy condition on behalf of its new owners by Victoria Air Maintenance at Victoria and was actually registered C-FAWZ to that company from 19th January to 1st February 1988 in connection with the test flying at Victoria. A Canadian maintenance company is not allowed to test fly a foreign registered aircraft, and so the Otter had to be registered in Canada, albeit briefly, for that purpose. It then reverted to N5056Q in Mar88 and set off on its delivery flight from Victoria to Tok, entering service with 40 Mile Air. It was heavily engaged in supporting mineral exploration camps out in the bush. 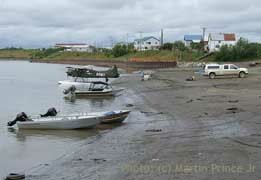 From its base at Tok, it flew into remote mining camp airstrips such as Slate Creek, Pogo and Robertson River. 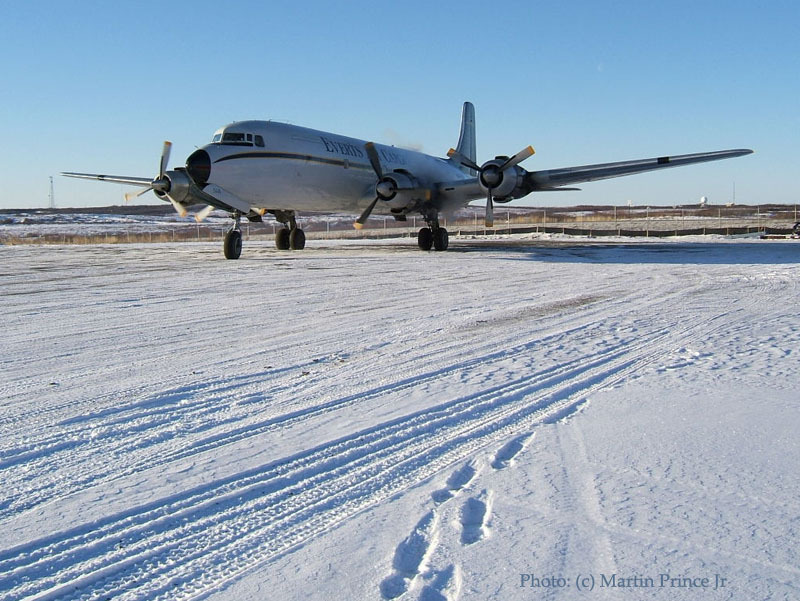 At one stage it flew alongside the company's other Otters N1037G and N3125N on a large exploration project at Yukon Flats. 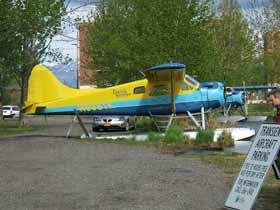 The Otter was damaged on take off from the Fairbanks International Airport on 10Feb89. 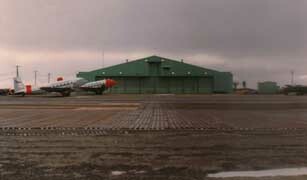 The pilot began his take off from the approach end of the 10,300 foot runway; at about one hundred feet above the ground, he found the Otter did not climb and would not accelerate in level flight and the Otter was damaged when the pilot aborted the take off on snow covered terrain beyond the end of the runway. An investigation revealed that the take off gross weight exceeded the maximum limit by 130 pounds and that the entire aircraft was covered with a coating of frost. The Otter was ferried back to Victoria Air Maintenance for repair, but that accident marked the end of its career with 40 Mile Air. 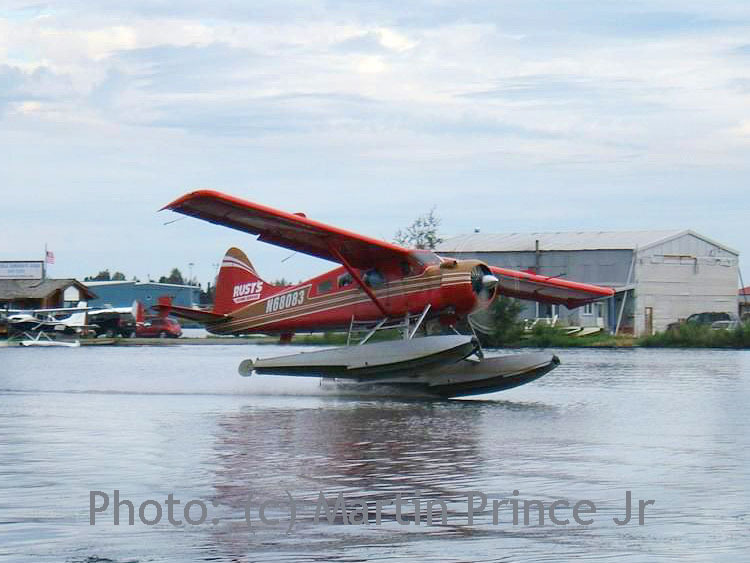 After repair, the Otter was sold to Central Patricia Outfitters Ltd, trading as Bottenfield's Winisk Air of Pickle Lake, Ontario to whom it was registered C-FFIJ on 08Aug89. 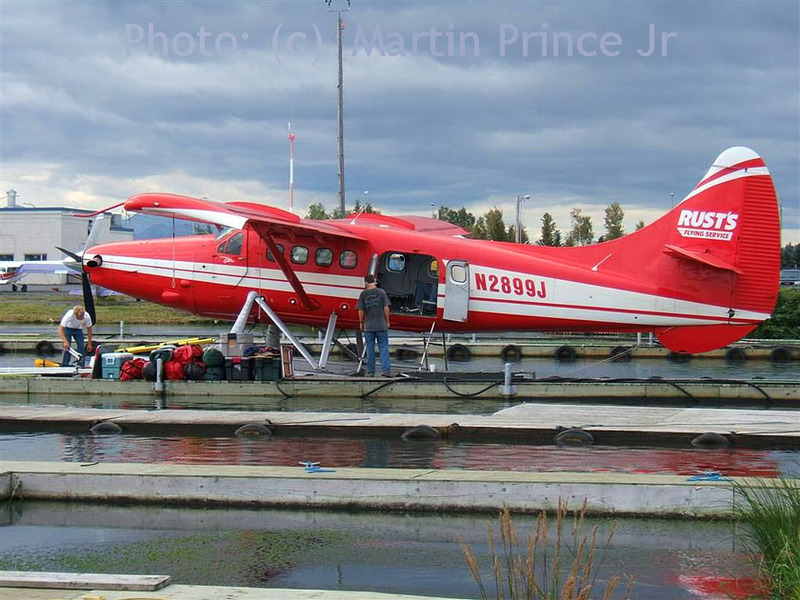 It was flown from Victoria to Sioux Lookout, Ontario where a set of floats were fitted, and 'FIJ entered service based out of Pickle Lake, servicing fishing camps. By Jan92 it had 6,700 hours total airframe time. 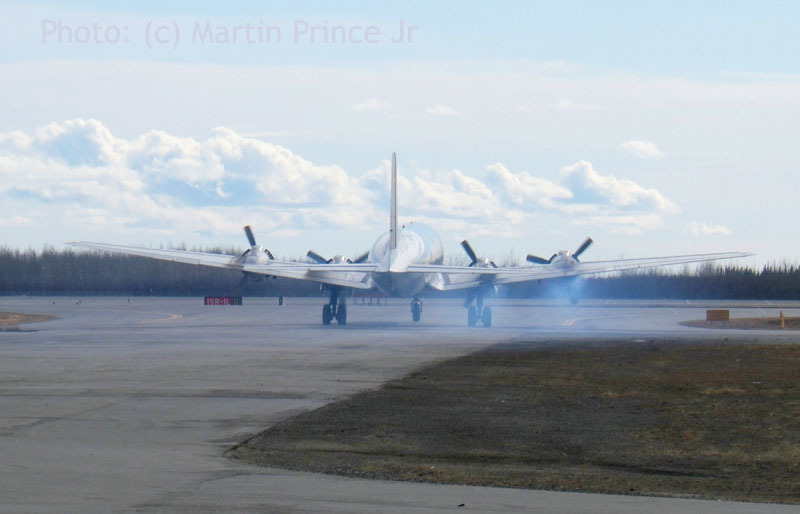 On 06Apr94 it met with a mishap eighty miles north-east of Pickle Lake, when taking off from an ice strip... To quote from the accident report: "The aircraft was reported to be just below maximum take off weight. 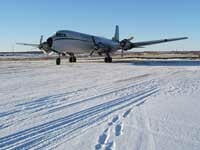 The wheel-skis struck a three foot high snow bank at the end of the ice strip and the pilot aborted the take off. The left strut collapsed and the left wheel assembly was driven into the fuselage. 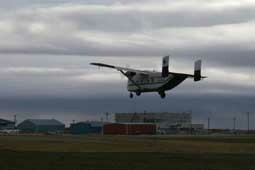 The pilot had accepted a five to ten knot tail wind for the take off and reported a strong gust at lift off". That incident ended the Otter's career with Bottenfield's Winisk Air. 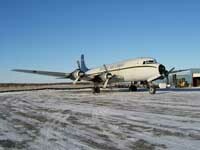 After repair, it was acquired by Leuenberger Air Service Ltd of Nakina, Ontario to whom it was registered in Aug95. 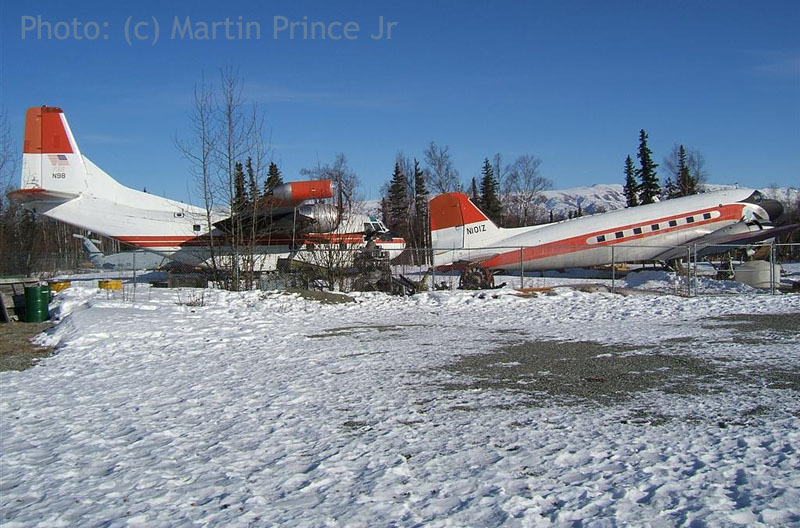 After a period of operation out of Nakina, it was sold on to Jeanne C.Porter, trading as Bald Mountain Aviation, of Homer-Beluga Lake, Alaska. 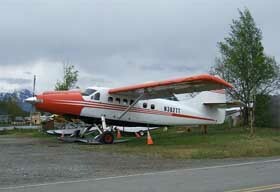 The Otter, still registered C-FFIJ, was noted at the Victoria Air Maintenance facility at Victoria on Vancouver Island during April 1997, being repainted and readied for its return to Alaska. 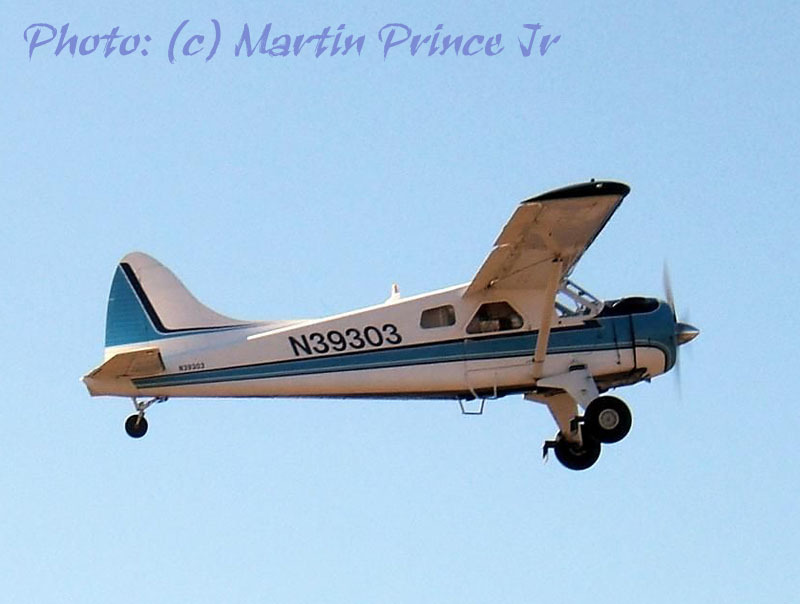 It was registered N103SY in June 1997 to Bald Mountain Air Service Inc, and joined Beaver N102SY. In April 2001 a second Otter joined the fleet, N104BM (118). All three aircraft were in operation during the summer of 2001 and were kept very busy. At the end of the 2001 summer season, Otter N103SY was advertised for sale, on EDO 71710 floats, with a total airframe time of 10,300 hours and an asking price of $360,000. 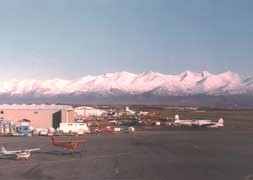 It was eventually sold, and was registered to Craig M. Schweitzer, Kenai,AK on 19Jun03. 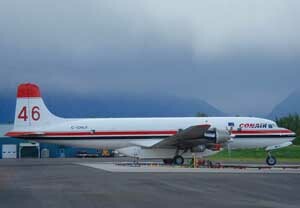 It arrived at the AOG facility at Kelowna, BC in April 2004 to be converted to a Walter turbine. 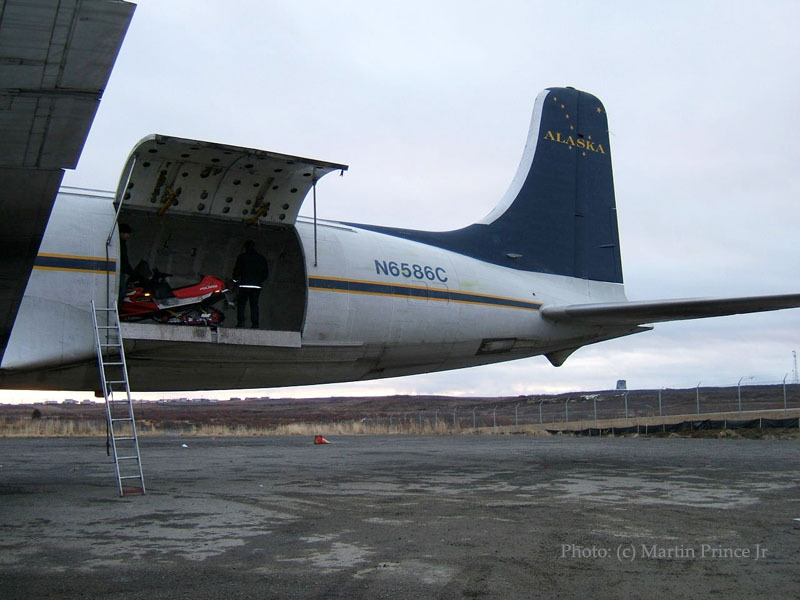 Martin: "I was on the ramp and talked to the Everts' manager; I was told that the Otter was here hauling 300,000 pounds of mining equipment up to the Kisaralik Lake in the Kilbuck Mountains." 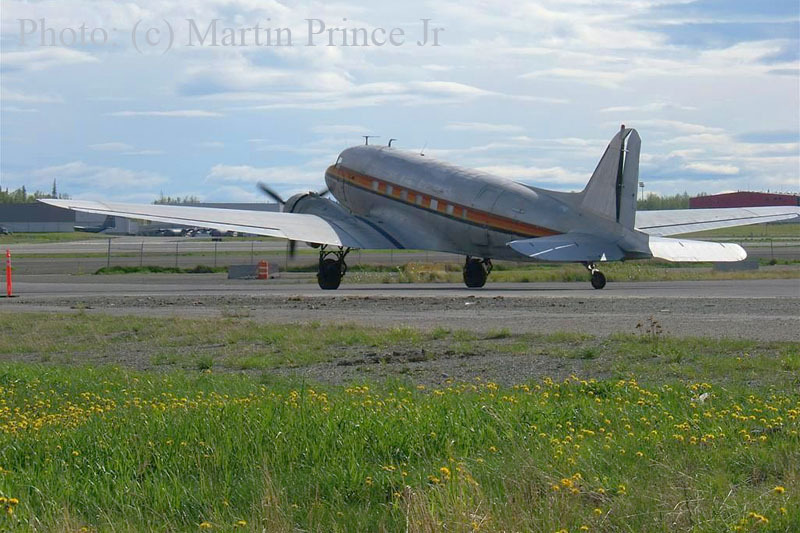 Following the conversion, it entered service with Mavrik Aire, based at Soldotna, Alaska. Its registered owner, Craig Schweitzer, is the head of Mavrik Aire, which also flies Beaver N613WB and some single Cessnas. 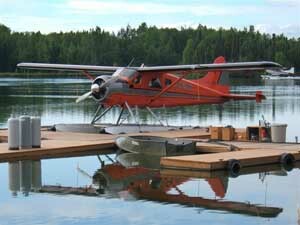 The company provides the usual range of Alaskan bush services, including fly-out fishing and hunting charters, bear viewing and scenic flights. (The text above was edited somewhat, shortened from the original text). 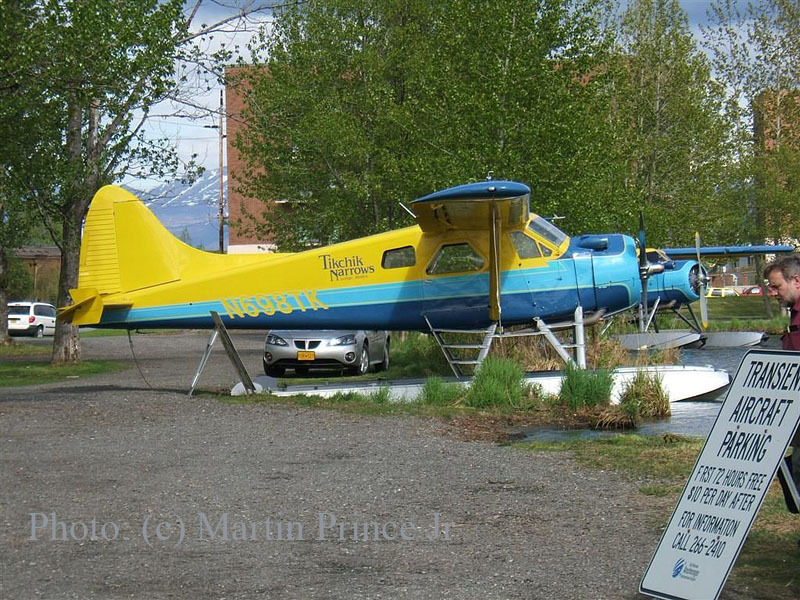 N103SY was registered on 12Jun07 to Ascention LLC of Kenai,AK. 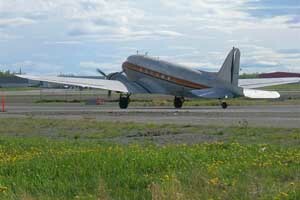 John Olafson noticed N103SY at Kelowna,B.C on 08Aug08. These pictures were taken about a week and a half ago, around 05Apr07 and as you can see, the snow melted pretty fast here. Martin Prince Jr sent me these photos, taken in March 2007. He wrote: "I am on holidays in Anchorage/Wasilla and I stopped in the Transportation Museum here in Wasilla and snapped a couple of shots of the two old propliners. The museum is closed for the season so I have no information on the two planes here." 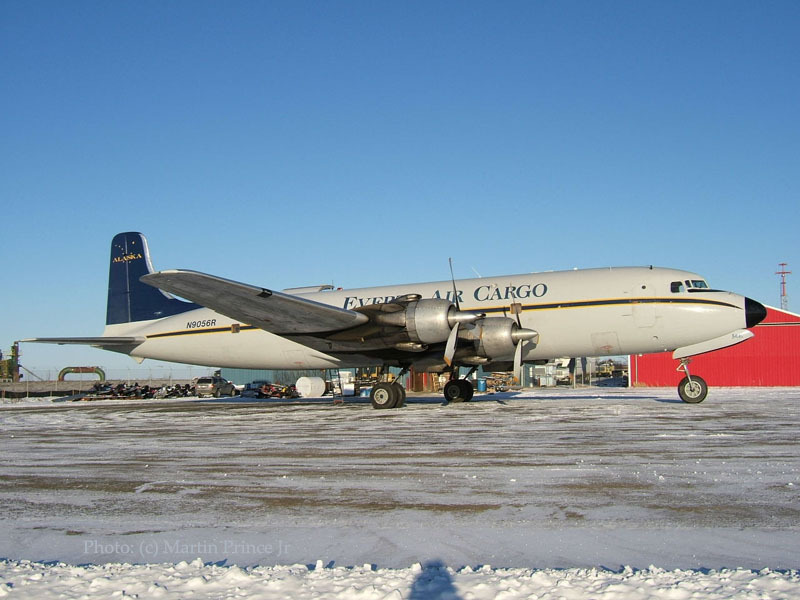 Martin added: "I talked to the manager at NAC here and he told me they are getting some old 737-200's from Alaska Airlines; he also said they are going to park the Six's and get rid of the 727 they have, pretty sad! " I could not agree with you more,Martin! "Here are a few shots of Everts N9056R this afternoon around 3pm, Saturday November 11th. We had a dusting of snow, nothing major yet and it finally got cold last week, its about 13F/-10.5C here." Thanks for getting out there in the cold, Martin ! "Here are some pictures I took before it got dark here this evening, 03Nov06. They are offloading Everts' N6586C here in Bethel around 1700." "I was digging around an old photo album of my father's and found a couple of pictures from 1977. 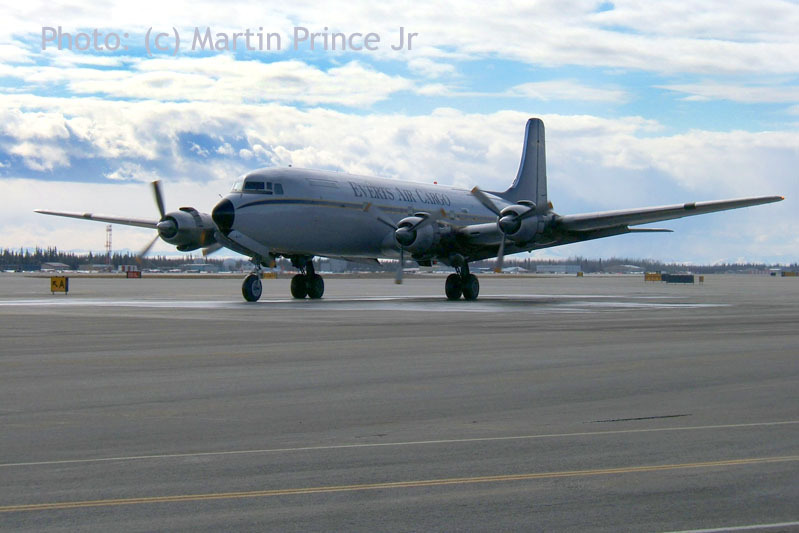 The first one is of Anchorage International Airport with Reeve Aleution DC-6's and a few of their C-46 planes and the Cargomaster way in the back." "This photo is from Barrow, Alaska with a couple of out of focus C-117's of the Naval Research and a Army National Guard Twin Otter." A nice touch, I think, is the approaching storm and some snow in the foreground. 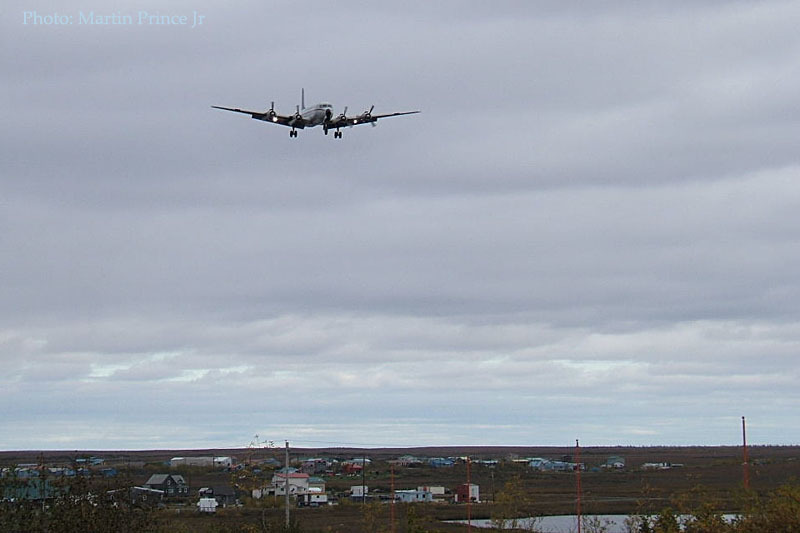 Here is a photo taken on 02Sep06 of a Douglas DC-6 of Everts Air Cargo in approach for Bethel. 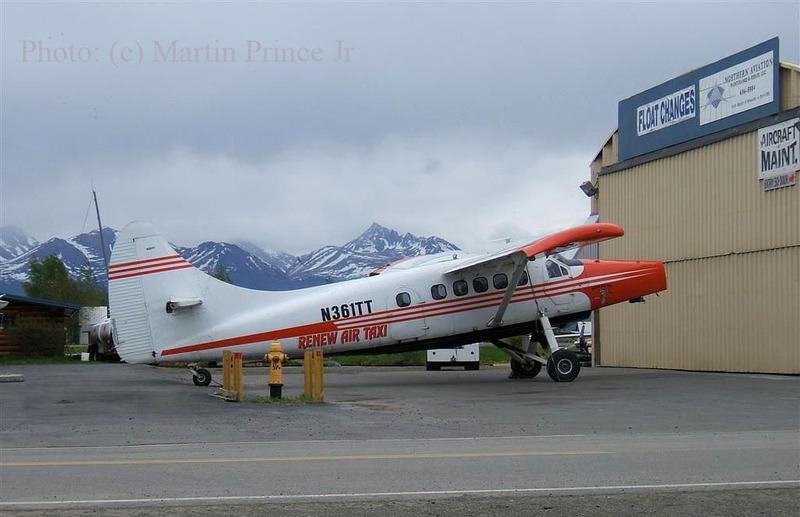 Martin added: "We have the 3rd busiest airport in Alaska!" "Here are some pictures of Arctic Circle Air's N1906 Shorts Skyvan. 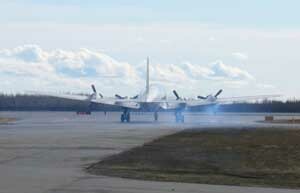 These were taken on 19Oct06 here in Bethel on the gravel runway 11 (this is a crosswind runway here at Bethel)." But by sheer coincidence Martin Prince Jr sent me some photos in Sep06, including these of N44587 ! 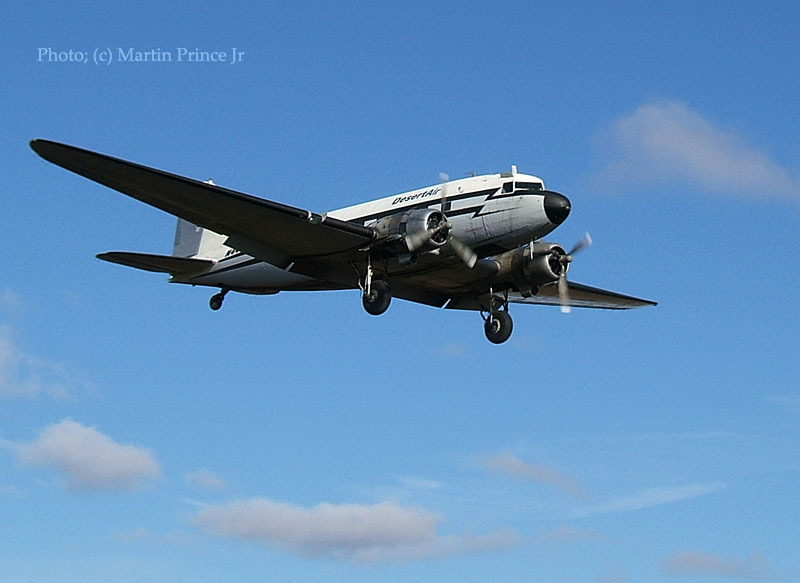 N44587 is a Douglas C-47A (c/n 12857), a very fine looking vintage transport and the "money-maker" for Desert Air. 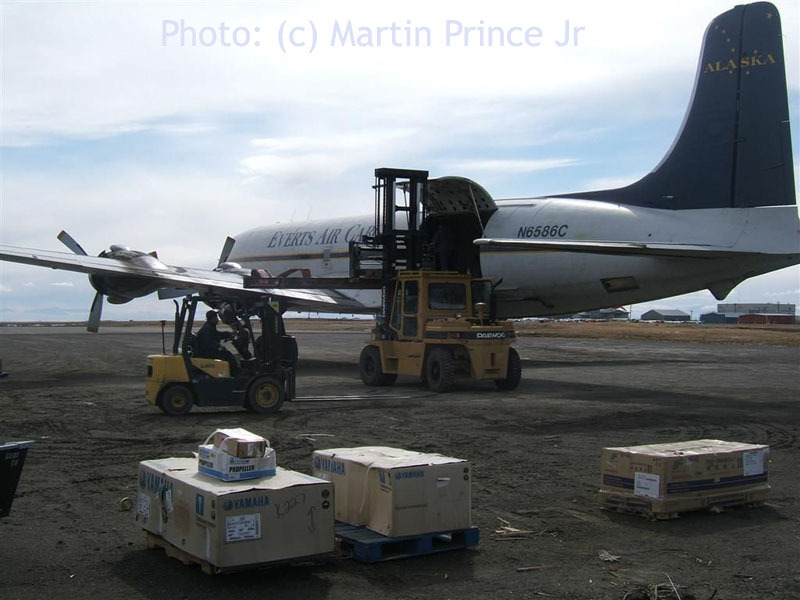 Dennis Gladwin is the owner of Desert Air Alaska and he started hauling cargo to Alaska's remote sites in the Spring of 2001. More can be read on my Alaska 2003 page. 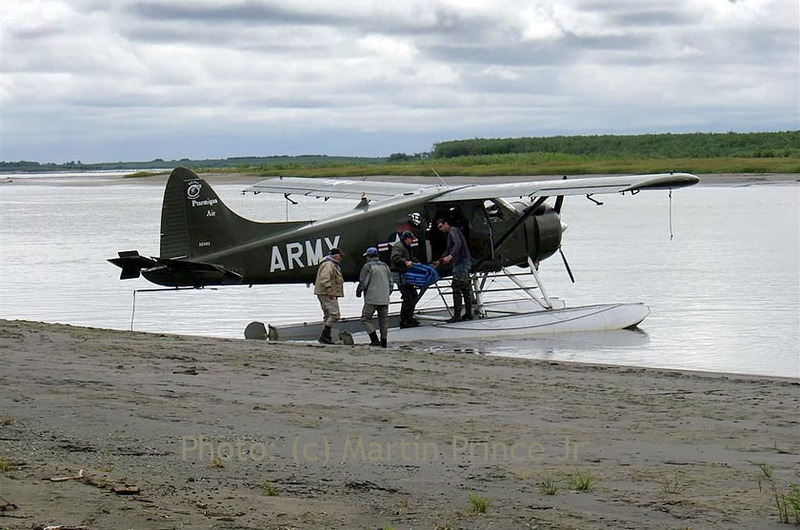 Martin also included this fine shot of a DHC-2 Beaver, at one time operated by Ptarmigan Air, still wearing the titles here. It is a brilliant photo, excellent photography ! "My name is Karl Powers and my brother (Steve) and I own N734Q." Indeed, it was registered 22Nov04 to the bros. Powers. By his emailadress I noticed his website: Pa Pa Bear Adventures, check it out! They are based in Bethel (aprox. 400 miles west of Anchorage) and their website tells all about hunting- and fishing trips and all kind of other adventures they can help you with. In June 2007 Martin sent me some more photos of N734Q: look up. 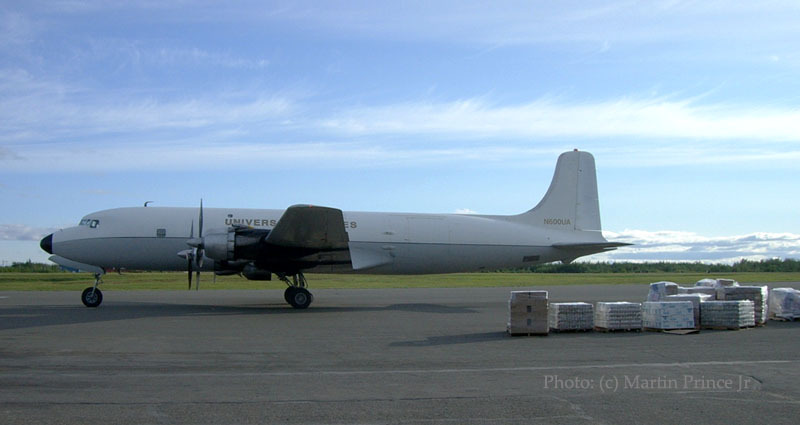 And here are some take in June 2008..
N401LC is a Lockheed L.100-30 Hercules, c/n 4606 and has been registered to Lynden Air Cargo since 21Apr1997. 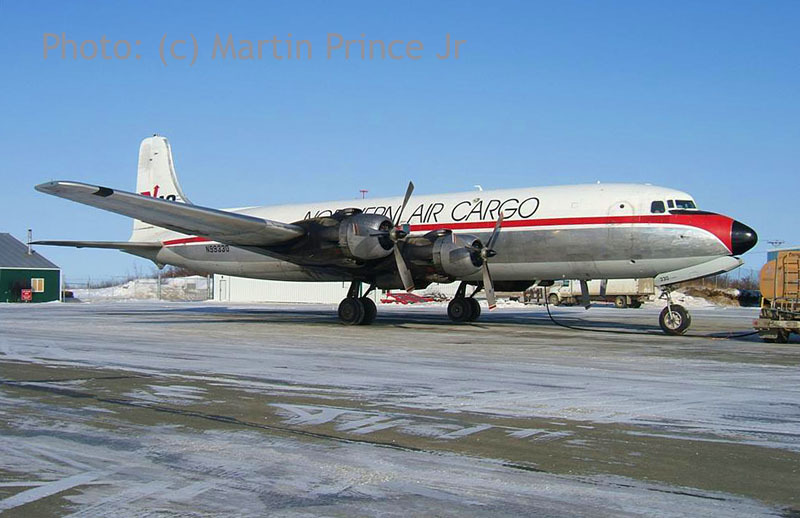 Martin: "I have here a picture of Universal's DC-6 here offloading 22,000 pounds of Hooper Bay Fire Relief this past August (2006). 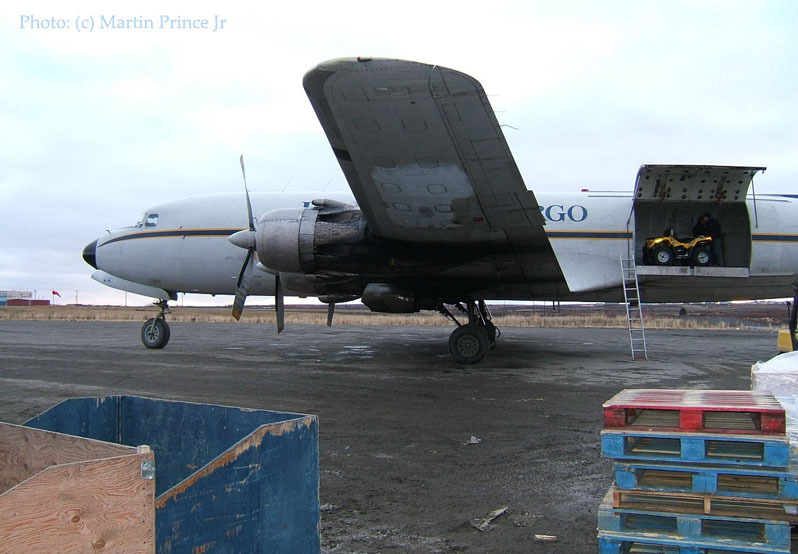 They offloaded at Arctic Transportation to haul out to Hooper Bay with their Casa 212s."